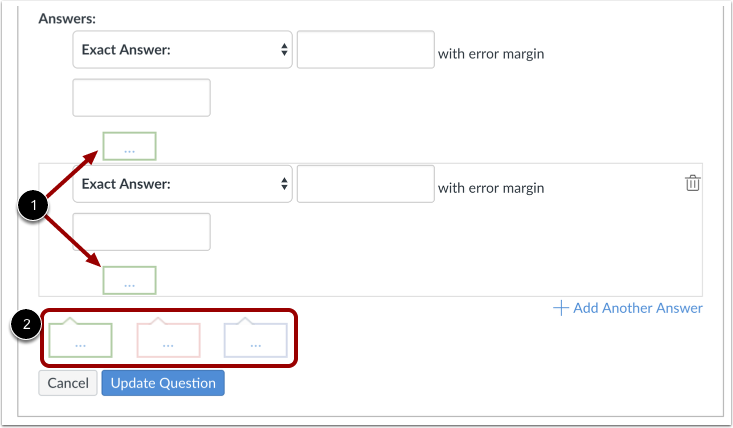 You can create a quiz question that requires a numerical answer, such as questions for a math course. Note: If you need help adding a mathematical formula in the Rich Content Editor, please see the Math Editor lesson. Click the drop-down menu and select the Numerical Answer question type . Exact answer : Enter the exact answer with the exact error margin allowed. For example, if the answer were 2.12 with a 0.01 margin of error, the quiz accepts any response between 2.11 and 2.13 (inclusively). By default, the margin is 0. Answer in the Range : Enter the range of answers that can be accepted as correct, such as answers between 8 and 10. Answer with Precision : Enter the answer with the precision number. The precision number is how many significant figures are expected in the answer. 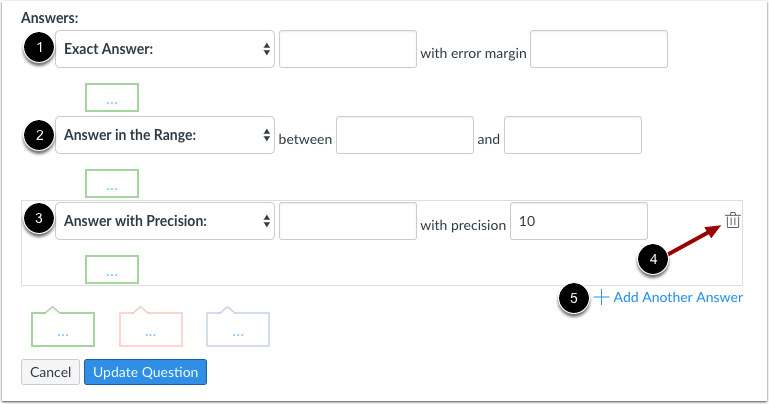 Precision answers can be negative numbers and should not include trailing zeroes. Student responses will be marked as correct if they omit the trailing zeroes, as long as all preceding digits are correct. By default, the precision number is 10, but answers can be rounded to a precision of up to 16 in standard or exponential format (e.g. 1e+26). Answers are accepted with or without the e exponent and are formatted according to the configured precision. Any numerical entries past 16 are truncated for grading and comparison. 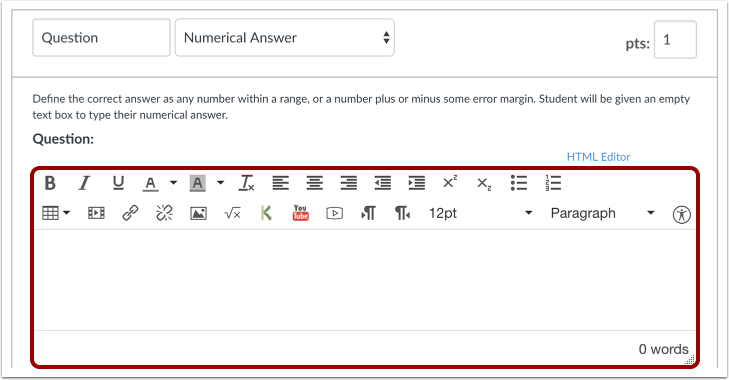 If any of the potential answers to a numerical question are a precision answer, then the student answer fields will accept precision answers. If none of the possible answers are precision answers, the student answer fields round to four decimal places. To delete an answer, click the Delete icon . To add another answer, click the Add Another Answer link . This is what students see when they encounter a Numerical Answer question in a quiz. If you allow students to see the correct answers, they will see correct responses in gray . If the answer was correct, the student will see a green flag  indicating the answer was correct. If you allow students to see the correct answers, they will see correct responses and allowable margin error . If the answer was incorrect, the student will see a red flag indicating the answer was incorrect . Previous Topic:How do I create a Matching quiz question? Next Topic:How do I create a Formula quiz question with a single variable? Table of Contents > Quizzes > How do I create a Numerical Answer quiz question? How can you have an answer that requires significant figures ignore trailing zeroes? 0.100 has three significant figures, the two trailing zeroes after the 1 are significant and differentiate the answer from 0.099 or 0.101. The trailing zeroes are only ignored if there are only trailing zeroes. The quizzing engine differentiates between 0.100 and 0.101 and 0.099. If the correct answer is 0.100, the question will be marked correct if the student types in 0.1, 0.100, or even 0.100000. The same goes for 0.101. If the student types in 0.101000, 0.101, or 0.1010, these will all be marked correct. However, if they try to type in 0.100 instead of 0.101, it will be marked incorrect. I hope this helps! I know it’s only been a few days since we responded, but I wanted to follow up with you to see if you had any other questions about quiz answers with trailing zeros. If you have further questions, please let us know. In the meantime, if we don’t hear from you, we’ll eventually archive this comment thread. We do this periodically to keep our guides updated and tidy. Thanks for adding your question. 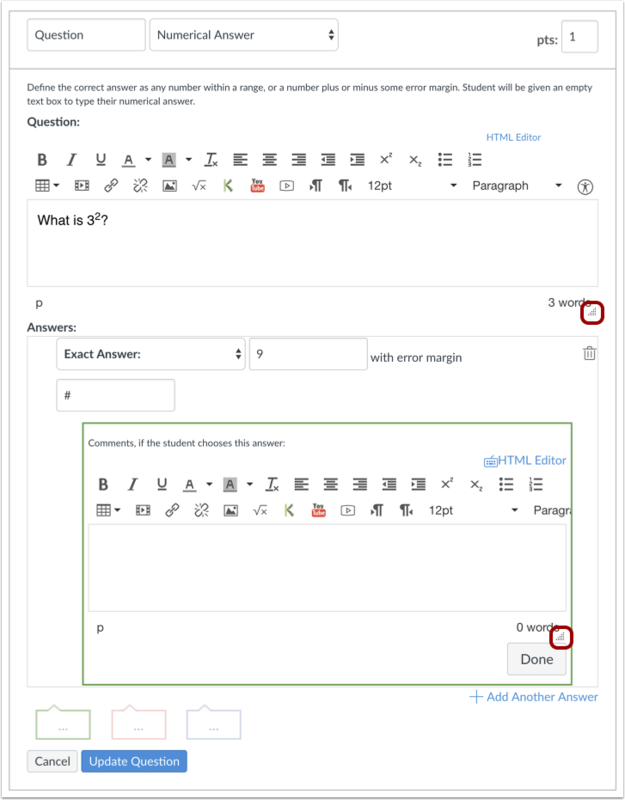 It's currently not possible to add a table in which students can add numerical answers. If this is something you feel should be added to Canvas, you could add a feature idea to suggest that functionality. Here are a couple guides that will walk you through how to create a new feature idea and the feature idea process. Canvas has been supporting scientific notation (e.g. 3E3 for 3*10^3), but when I try this with small numbers it defaults to zero. For instance, 2E-4 works, but Canvas replaces 2E-5 with 0. Does someone know how to fix this, so that I don't have to ask my students to convert to a different unit to submit their response? I did some quick testing with this and I could only get these small numbers to work if I selected the Answer with Precision option for the quiz answer format. Will that option work for your questions? Let us know if that works or not. You might also want to consider posting this question in the general Community Q & A so it gets a wider audience. Yes, this worked for me. Thanks.